My three children have left home! My middle daughter moved out at the beginning of last year and although we missed her terribly, there was not too much of an adjustment in terms of household management. My youngest daughter moved out at the beginning of March 2015 and my son towards the end of March 2015. SUDDENLY I felt quite lost! Mornings I would make coffee and toast for my youngest and hang out with her while she was getting ready for work! The first week or two after she left I would get up and wander around not knowing quite what to do with that half hour!! I had been cooking for a family and almost overnight I had to make food for just hubby and myself! For the first two weeks dinner was a cause for panic - and we would invariably end up eating out! Not being inclined to "mope", hubby and I got over the shock of having an empty nest and embraced this new chapter in our lives with open arms! I gave away most of my "big" pots, pans and bakeware - and then went on a bit of a shopping spree to buy "just for two" replacements. I began mercilessly cleaning out rooms and selling or giving away any excess. My yarn stash had to be tidied out too as there were a lot of partially used yarns which were making my space look untidy. 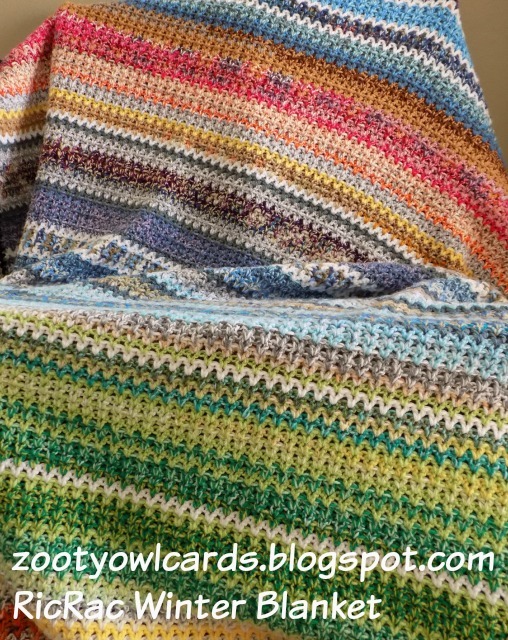 I wound various thicknesses of yarn together to give a total of 16ply (DK plus DK; or 2x4ply plus DK) and then set about making a HUGE chunky scrappy blanket which is perfect for cold winter getaways! I wound all the scrap yarns together before I started so that I would not end up with too much of a colour mishmash! I just kept going until the yarn was all finished and I had a blanket which covered the top of my King Size bed. There were way too many ends when I was finished so I used them to make braids instead of working them in. All in all a very rewarding exercise! My yarn stash is once again tidy and we have a lovely snuggly RicRac Blanket!! It's absolutely gorgeous; I'm really impressed. Well done! What a great idea! My mom used to put ricrac on everything, so you've made me feel very nostalgic. Love the braid idea, and they look beautiful. I think I'll copy you! I love RicRac - my granny also used it a lot! Hugs! It is difficult - but doing things just for you go a long way to ease that empty feeliing! So beautiful, but 250 stitches across must have been difficult for such a large afghan. I get frustrated when rows go more than 50. Guess I'm impatient to get things done! Really special afghan, though! It was a bit difficult to manage once it started growing! Luckily it is winter here so I could cuddle up under it while I was crocheting. The pattern is pretty "mindless" so I kept my hands busy while watching telly and the colour changes made it fun! Lovely blanket. And I am just a little envious of your empty nest, I am one third of the way there with two teens still at home. This has really grabbed my attention. Just one thing - I understand everything however.......... I cannot see if you have done completed rows with each "ball" of yarn. Did you complete a full row (2.3) with one lot of mixed colour ball and have some left over or did you keep going until the ball ran out meaning some rows are joined in the middle and half/half? Sorry that I cannot explain this better. Thank you.